The band will perform for the College Band Directors National Convention the weekend of Feb. 24 to Feb. 27 in New York City. The ensemble will perform a series of concerts held at the Lincoln Center for the Performing Arts, under the direction of Larry Livingston. Other Prestigious ensembles performing at the conference include the New England Conservatory Wind Ensemble and the Eastman Wind Ensemble. The Small College Intercollegiate Band is made up of musicians from schools such as USC, Rutgers, Ithaca College and many other elite institutions. 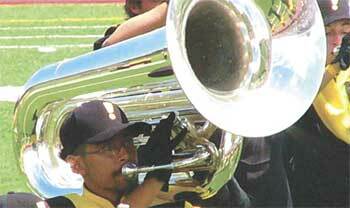 Rafael Arenas is a three-year veteran of Impulse, and has been contrabass section leader since 2004. His goals are to complete a university degree and pursue a career in music. Arenas has demonstrated tremendous personal growth and leadership qualities, and he has the support and gratitude of Impulse and Impulse Youth Arts.